Grønningen lighthouse was established in 1878 and belongs to the first generation of concrete lighthouses in Norway. The solid concrete was well suited for building on exposed and weather-beaten locations like here at Grønningen. The station appears almost as a fortress, built to withstand the forces of the waves washing over the rock. Although the mainland is not far away, the people were often isolated in bad weather. Grønningen was automated and de-manned in 1980. The station is owned by the state and protected as a national monument under the Cultural Heritage Act. The state cooperates with the local heritage organisation, Bragdøya Kystlag, that is responsible for maintenance and alternative use. Grønningen was the first of the Norwegian lighthouses to be opened for visitors by voluntary, hosting families in the summertime. Off season the lighthouse can be rented for social and cultural events.Grønningen and the surrounding rocks are classified as a bird-sanctuary, and access is restricted in the nesting season (15.04-15.07). The need to safeguard the entrance to the important harbor of Kristiansand was given the highest priority by the first Norwegian lighthouse commission in 1830. As a direct consequence, the coastal light at Oksøy and the harbour light at Odderøya was established in 1832. After several accidents in the dangerous waters on the eastern side of the Kristiansand Fjord, it was decided to build a third lighthouse at the small islet of Grønningen. Later the entrance was further secured with a secondary light at Oksøy and a light beacon at Kinn. Together, the three lighthouses in Kristiansand are representative of the national lighthouse history both in an architectural and functional sense. The coastal light at Oksøy, with its 36 meters high cast iron tower, the concrete fortress at Grønningen marking the fairway into the fjord, and harbour light at Odderøya, with its small, wooden house, built for just one keeper and his family. 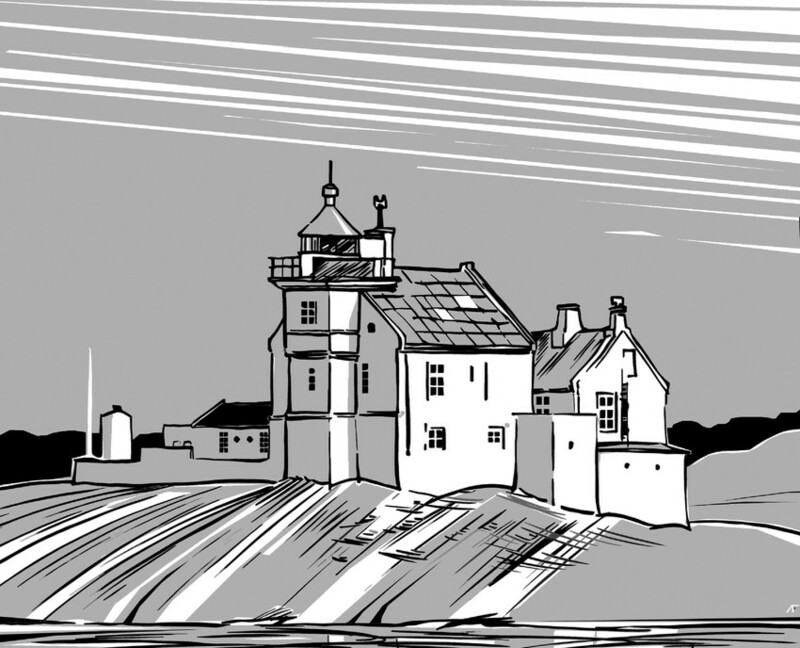 In 1878 there was only the main building, a small outhouse and a boathouse at Grønningen. The keeper and his family and the assistant all lived in the same house, where the lantern was placed in the gable. In 1890 a fog-bell was installed, but the signal was too weak. In 1919, it was decided to replace it with a fog-siren, and a new building with an engine room and living quarters for an extra assistant and his family was erected. The fog signal was again modernised in 1938, and several attempts were made to improve the difficult landing conditions. At the most, 16 people were living at Grønningen. The two families had 11 children and a governess was engaged for their education. In the 1960-s, the station was manned with a keeper and two full time assistants, plus a part-time substitute. An electric cable from the mainland came in 1979 and the year after Grønningen was automated and de-manned.